When choosing a good DVD ripper and copier software, no matter paid or free, you need consider lots of aspects like: whether the DVD ripper can deal with copy-protected DVD discs, how many output formats you can get, the speed of DVD ripping process, has a built-in editor or not, etc. To save your time, we just give the review of the top-ranked DVD ripper and copier software in 2017-2018, after reading you can select the desired one effortlessly. The good: Brorsoft DVD Ripper (Windows/Mac) can quickly and losslessly rip/convert any (protected) DVD disc, VIDEO_TS folder, DVD ISO and IFO file to 250+ popular formats including: 4K/1080P/720P H.264/H.265 MP4, MOV, MKV, M4V, WMV, FLV, AVI, 3GP, MPEG, 3D videos and more. Meanwhile, as a good DVD copier, it provides two models for you : Copy DVD main movie only or Backup DVD whole content. The bottom line: With decent decrypting capability, high quality video output and considerate backup solution and specific format templates for versatile PMP devices (iPad, iPhone, Apple TV, Xbox, PS3, Android tablets and phones, etc), Brorsoft DVD Ripper ranks top on the DVD ripping application lists. The good: Brorsoft Video Converter Ultimate (Windows /Mac) is an all-in-one Blu-ray/DVD/Video converter which lets you rip, backup Blu-ray/DVDs and convert any video format in one place. With it, you can effortlessly achieve all your multimedia demands and enjoy video/DVD/Blu-ray anywhere and anytime you like. Besides, Blu-ray/DVD backup and rip functions, you can also use the all-in-one video converter to convert 4K XAVC (S), MTS, MXF, H.265/HEVC, MP4, AVI, MOV, etc videos to any video formats as you want. The bottom line: As one of the best DVD ripper and copier software, Brorsoft Video Converter will never let you down. The good: Handbrake is open source software that provides an excellent quality of transcoded video. The program is also small in size, packed with great features that further improve synchronization. It supports multi-platform and provide excellent output video quality. The Bad: Handbrake cannot rip protected DVDs, and transcoding speed is slow. 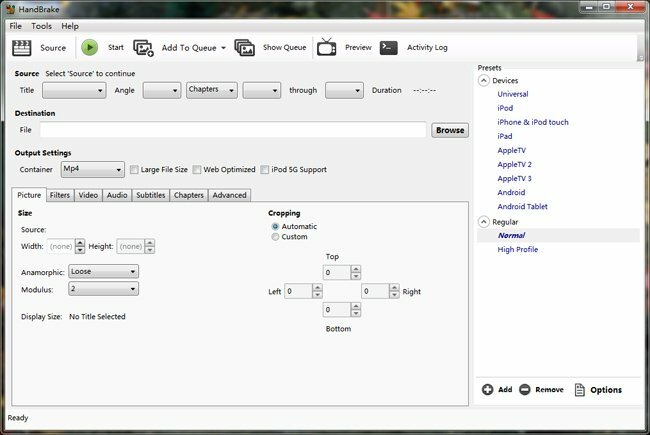 The bottom line: As freeware, Handbrake is good at ripping home-made DVD to H.264 MP4/MKV formats and provide presets for iOS, Android devices. The good: MakeMKV is highly praised for its ability to quickly and easily rip DVDs and Blu-ray discs to high quality MKV files with a single click. The app has been in beta for a long time (years, in fact), which is just as well, since the developers promise to start charging for Blu-ray ripping once the app leaves beta. The app's strong suits are that it's fast, super easy, and cross-platform (the Linux version is available in the forums.) Plus, the app preserves all of the source disc's information, including tracks, chapters, HD audio, menus, and so on. The bad: It's not able to support new protection scheme with latest DVDs and output format is limited to MKV. The bottom line: MakeMKV is good at ripping protected Blu-ray/DVD disc, and you have 60 day free trail with MakeMKV beta, after which you need to pay for it. The good: WinX DVD Ripper Platinum is also a great and easy to use DVD ripping tool. With its presetting profiles, you would be finished with your ripping task in a jiffy. It is fast and straightforward and supports ripping DVD to AVI, MP4, WMV, MOV, MPEG, FLV and many more. The bad: It doesn't has 3D output formats, and provides limited video editing functions. The bottom line: Winx DVD Ripper Platinum is good at ripping and backup protected DVD for playing on portable devices. With above introduction, I can say all of the top 5 best DVD ripper and copier software have its own advantages. So, if we need to place a final word on selection of one, we have to strictly depend on your needs and experience with multimedia copier and ripping software.